My friend Joel asked me for help making a white sauce/macaroni and cheese, and so here it is. This is an adapted version of a Rachael Ray recipe, and is very fast and easy. This is one of Dave's favorite dishes; I made it for Christmas Eve dinner. For some reason, Blogger made me break this post up into three parts, so I'm sorry for the choppiness. I think the photos are pretty easy to follow though. Melt the butter in a saucepan on medium heat. When it is melted, add the flour. Whisk the flour and butter together until it is well mixed. Let it cook for about 3 minutes to get rid of the raw flour taste. Slowly add the milk, and whisk well. Bring the sauce up to a light boil, whisking very frequently. This is a basic white sauce and you can stop here; just add some salt and pepper to taste. 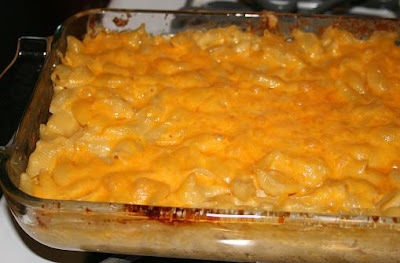 To continue with the cheese sauce: with the heat on very low, slowly add the cheese, whisking well after each addition. As soon as all the cheese is incorporated, take the pot off the heat. Season the sauce with salt and pepper to taste. Mix the cheese sauce with the cooked pasta and pour into a 9 x 13 baking dish. Top with some additional grated cheese. Bake in a preheated 325F oven, just until the cheese is melted on top, about 15-20 minutes. Serve while nice and hot. Enjoy!